SEO Tools You Can Use Today presentation from Affiliate Summit East 2009, which took place August 9-11, 2009 in New York, NY. This session is a quick moving brain dump of how to use the most advanced powerful tools to help you with SEO. Expect to learn how you can walk out and use several SEO tools to grow revenues today. Eric Bearse – Who Is John Galt? I’ve been thinking about comments from Eric Bearse, Texas spokesman for the Alliance for Main Street Fairness, in the past Sunday edition of the Austin American Statesman. 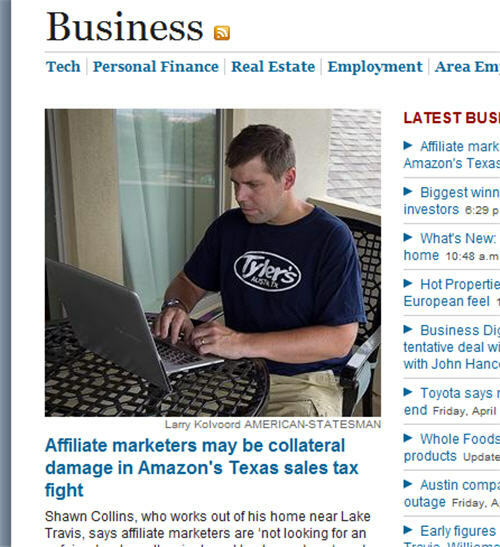 In “Affiliate marketers may be collateral damage in Amazon’s Texas sales tax fight” by Barry Harrell, I emphasized how affiliate marketers (small business owners who create jobs and help build the economy) just want to work and contribute. This was followed by a comment from self-described “p.r. schmuck” Eric Bearse. The other side of the argument is that job losses can happen in any field. And traditional retailers say they’ve had to cut jobs because of revenue they have lost to untaxed online sales. So the bogeyman here is the sales tax, as if there were no other factors. In the article, she goes over eight reasons, sales tax not included, that folks choose to shop online, including convenience, selection, and deals. What the Alliance for Main Street Fairness doesn’t seem to understand is that you can’t legislate shopping preferences. At least I hope they don’t think they can impose such a thing. I just saw on Theresa Farmer’s blog that she has taken a job as Chief Operations Officer at Optizmo Technologies. If you’re not familiar with Optizmo, they are a solution for automating suppression list management and streamlining subscriber “opt-out” preferences. Below is a picture of Theresa with ShareASale CEO Brian Littleton. Sort of a random picture, but the first one I found that I had taken in the past with Theresa in it. Now, I don’t usually blog about career moves, but this one was noteworthy to me, because Theresa is affiliate marketing royalty, as she co-founded Kowabunga! Technologies with her husband Todd back in 1996. On a related note, Optizmo CEO Khris Thayer has an article on email compliance in issue 14 of FeedFront magazine. Good luck to Theresa and Optizmo. Unbounce, a service easily create landing pages, has integrated with AWeber, an email service provider. The pairing of AWeber and Unbounce totally makes sense for affiliates, since many landing pages focus on converting visitors into subscribers. The purpose of this integration is to have all the subscribers who sign up on your Unbounce page automatically added to your AWeber list. And Unbouce has kept things simple, so there are just a few steps that you need to do to sync up the two services. See the AWeber blog for instructions on setting up Unbounce with AWeber. In addition to this use with AWeber, it’s one of my favorite services, as it enables me to easily build my email lists, as well as automatically create newsletters by generating them from my blog RSS. I got an interesting and tasty promotion for the upcoming book, Get Rich Click, by Marc Ostrofsky. He sent a pecan pie in customized packaging from Goode Company BBQ of Houston, a company that is featured in his new book. Page 41 to be exact. The book is a neat, interactive experience, where the page that includes the Goode Company BBQ story has a QR code and link that will take the reader to an interview between Marc and Levi Goode, president of the company. These QR codes and links continue throughout the book. 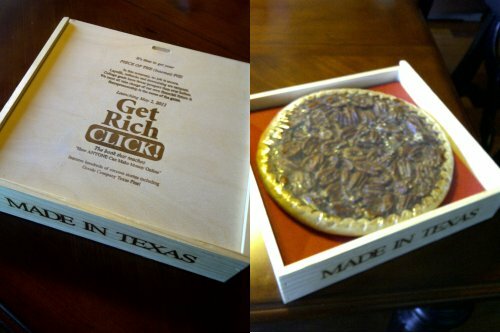 The package also included a press release for Get Rich Click, which is coming out May 2, 2011. I am nearly finished with the book and will have a review up soon. And if you didn’t see the news, Marc Ostrofsky is going to be giving the opening keynote at Affiliate Summit East 2011. David Vogelpohl spoke on “7 Ways to Squeeze Every Last Cent From Your Merchants” (slides) at the Affiliate Summit Meetup in Austin, TX on April 26, 2011. David discussed how you can leverage your merchant relationships to earn more money, get freebies for your website and get a leg up on your competition! Plus, he took care of lunch for the crowd of hungry Texans – thanks a lot, David! David has been managing affiliate advertising campaigns since 1996, including campaigns running on all the major affiliate networks, private affiliate networks and in-house affiliate systems. He has overseen creative strategies, affiliate acquisition, affiliate management, offer strategies and fraud detection both as an in-house executive and through his online marketing business, Marketing Clique. David is an active blogger on the popular marketing blog, Marketing Pilgrim. LinkShare announced today that they’ve seen 37 percent overall same store year-over-year sales growth in the first quarter for their merchants and affiliates. This outpaces overall e-commerce growth. Forrester Research predicts e-commerce will grow at a compound growth rate of ten percent over the next five years. The growth for LinkShare in the first quarter of 2011 continues a trend from 2010, a year in which LinkShare saw record growth during cyber week. LinkShare also saw continued growth in the number of merchants and affiliates with over seventy-five new merchants and thousands of new affiliates joining in the first quarter of 2011. New merchants include Panasonic, Build-A-Bear Workshop, American Greetings, and HMX Group (Hickey Freeman, Hart Schaffner Marx, Bobby Jones, Exclusively Misook, Monarchy Collection, Christopher Blue). Jeremy “Shoemoney” Schoemaker gave the first in a new series of Affiliate Summit webinars entitled SEO from Experience. In this webinar you will learn how to shoot your way to the top of search engines by analyzing your competition. Jeremy always distances himself from the SEO Guru title, because he does not believe in theories or over analyzing patents, but rather learning from others experiences and integrating them. In this webinar, he shares how he has dominated his competition for some of the most competitive and profitable keywords, and he shows how to do it in your competitive space. The Austin American-Statesman had a nice, balanced article on the advertising tax battle in Texas this weekend. I had a chance to chat with the author of the piece, Barry Harrell, and share my story. This is all predicated on the assumption that people shop online strictly to save on sales tax. That is simply “fairness” mythology. How about convenience, better pricing, more selection, etc.? Seven Deadly Sins of Landing Page Optimization presentation from Affiliate Summit East 2009, which took place August 9-11, 2009 in New York, NY. Landing Page Optimization can skyrocket your profits. Learn how to avoid the most common landing page problems in this fast-paced & informative session with Q&A at the end.